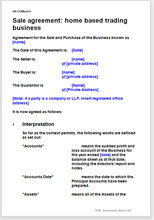 This is a shorter document, stripped down to cover the requirements of a buyer of home based trader. Covers full e-commerce provisions. It assumes no real property and no employees are to be transferred with the sale.